Summer is right around the corner (June 21st) and I have a few DIY spring cleaning projects I want to get done before then. My first project was inspired by a visit to my old apartment. My former roommates still live there and I saw this greeting card "clothesline" that I made a long time ago. This is a place where greeting cards and photos can be displayed for all to see rather then being tucked away in a drawer, plopped on the refrigerator or recycled. It's really cute and it updates it's self based on what mail you get. When It gets full I start replacing the old with the new. To make this Card Line all you need are some nails (and a hammer) or pushpins, some heavy floss, embroidery floss, or hemp & mini clothes pins. 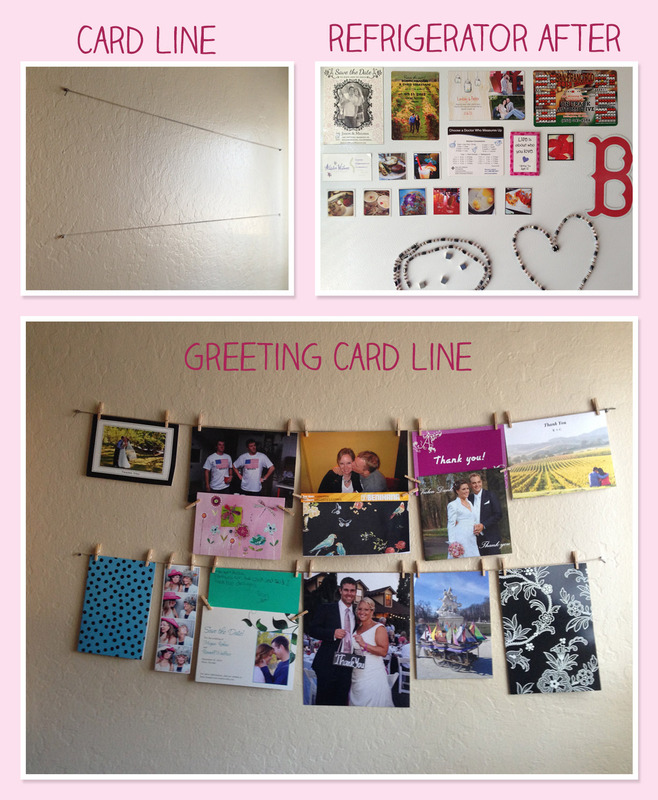 Find a good space on a wall and measure about 10 inches between the placement of each Card Line. I would make 2-4 lines depending on how many cards and photos you receive. Make a little pencil X on the wall to mark where the nails will go. Hammer in your nails and then tie on the string. After your lines are hung layout all the cards and photos you have on the floor to get a feel for how you want to display them. Then, attach with mini clothes pins and you are done. 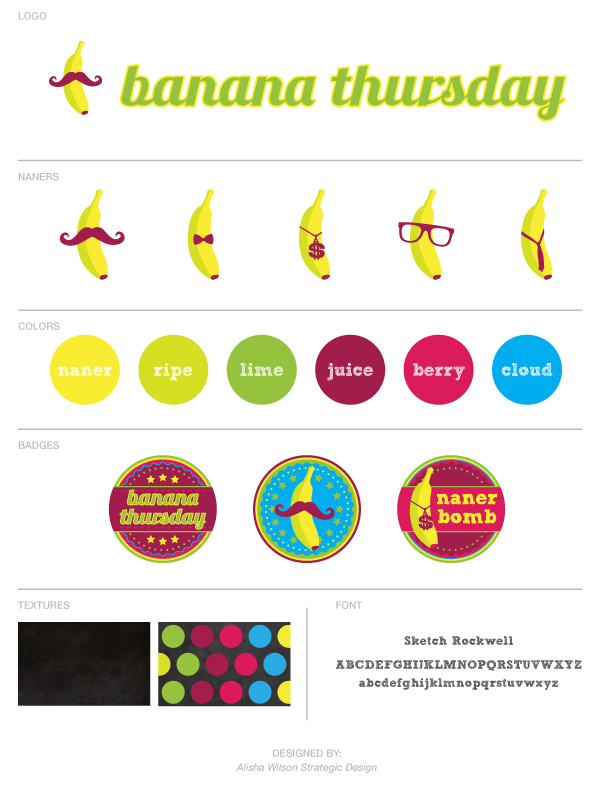 I recently finished this identity design for Banana Thursday. I had a lot of fun working on this project because I got to let my personal design style shine through. Banana Thursday is an electronic dance music fan group. Members dress up like bananas and rock out. I've learned that dressing in a banana suit in a large crowd makes it rather easy to find your friends. Check out their Facebook page, which I also designed. Starting off the new year right is important to me. I've read a few different people's approaches to setting goals and resolutions and I've taken advice from a few different people I admire. Step one was to look at 2012 and see what I've accomplished. I called out 4 important things i did each month. It's important to look at all you've accomplished before setting goals for the new year because it's positive reinforcement for yourself. Lets be honest, when do you really give yourself much praise? 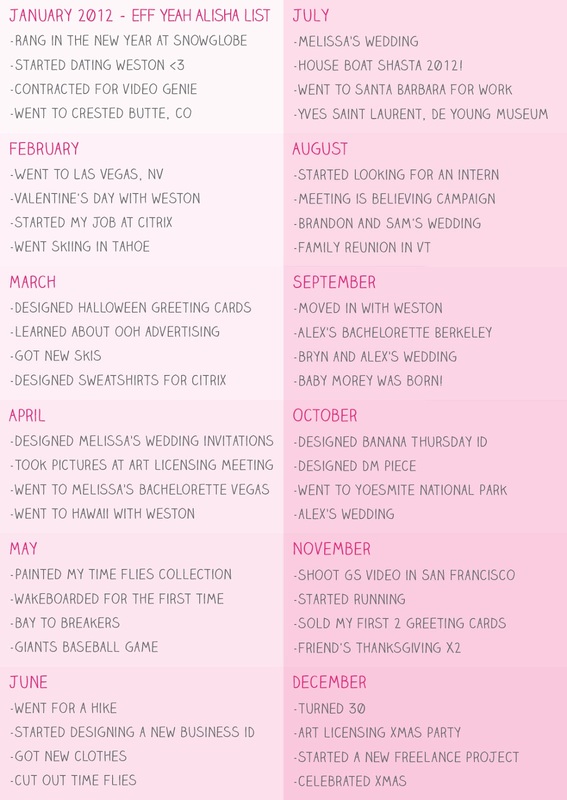 Last year my main accomplishments included starting to date my wonderful boyfriend and moving in with him, completing over 30 freelance design projects and getting a new full time job. I traveled to Crested Butte, CO, Las Vegas, NV, Tahoe, Maui, Hawaii, Santa Barbra, CA, Portland, OR, Lyndon Center, VT and Yosemite National Park. I sold my first 2 greeting cards! I learned how to wakeboard and started running. I need to cut out some of the things in my life that are taking up my time that I don't enjoy or feel obligated to do. The biggest thing in my life that I can think of is my freelance work. From this point forward I am not taking on any freelance work because it's "extra money." I don't need the money, I have a full time job. I will only take on freelance work if it will be an asset to my portfolio in my quest to become an art director. Or if I truly enjoy the work and client. Other things that take up my time that I don't like doing are laundry, fixing/setting up computers, going to the post office, writing contracts and invoicing. 2012 was full of fun relationship things, it's been awesome. 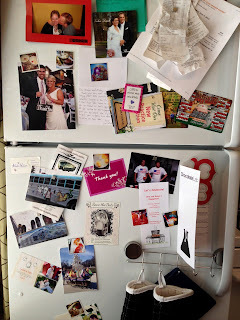 In 2013 I want to reintroduce more of the things I love into my life while still doing fun relationship things. I want to attend art shows and museum exhibits, I will run a half marathon in September. I also want to travel internationally this year. 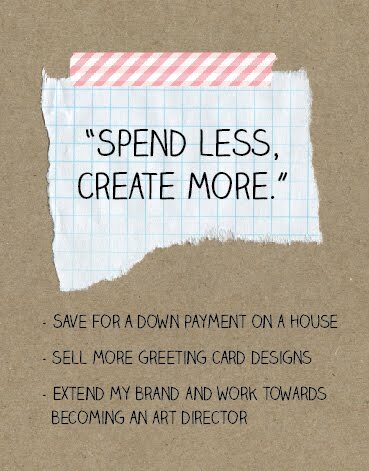 My phrase for 2013 is "Spend less, Create more." Hand Made Holiday Ornament exchange! I'm gearing up for the holidays! For the last 2 years I have participated in the Hand Made Holiday Ornament exchange! Cindy Ann of Blu Penny puts this on every year. This year I have a great idea for my ornaments. I can't wait to get started. You get put into groups of four people from all over the place and you get 3 new cool ornaments from the others in your group. Click on the link to find out more details, and happy crafting! 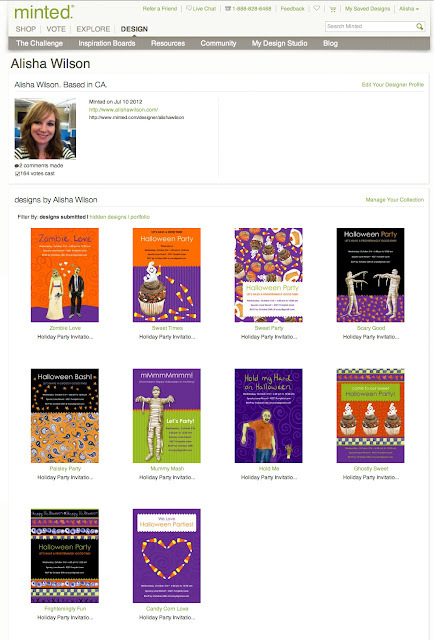 I've been working on this collection for a while and just entered these Halloween Invitations into a contest on Minted.com please help me win by clicking on each of my designs and voting for them! You can also click the button on the right hand side of my blog. Thanks for your help!